This is the first of a series of three blogs addressing the claims and arguments of "Revisionist" coryphée Carlo Mattogno regarding cremation of the people murdered at Chełmno extermination camp. Chełmno extermination camp operated in two phases. During the first phase, between December 1941 and March 1943, at least 150,000 people were killed. In the second phase, which lasted from June 1944 to January 1945, a total of 7,176 Jews were deported from Łódź to Chełmno and killed there between 23 June and 14 July 1944. The victims of the 1st phase, which by June 1942 already numbered close to 100,000, were initially buried in large mass graves in the Rzuchów forest. In the summer of 1942, decomposition gasses emanating from the graves polluted the whole surrounding area, whereupon burning instead of burial became the camp’s body disposal method, which starting in the autumn of 1942 was also applied to the corpses previously buried in mass graves. Witnesses mentioned various cremation devices and methods used to burn the corpses during the camp’s 1st phase. The Bonn District Court concluded on a single cremation oven consisting of a pit with an area of about 4 x 4 m and a depth of 2 m, some iron rails as a grid and an air shaft laterally entering the soil. The Central Commission for Investigation of German Crimes in Poland mentioned two crematoria, adding that details about the furnaces were lacking because the investigator (Judge Władysław Bednarz from the District Court in Łódź) could find no witnesses who had been in the wood in 1942 or 1943, and those who lived near the camp had only noticed two constantly smoking chimneys within the enclosure. Archaeologist Łucja Pawlicka-Nowak mentions "repetitive accounts about burning corpses in bonfires, which took place in the initial phase of opening the mass graves and was aimed at quick liquidation of the decomposing bodies" . Former police officer Frank Sch., who for a time had been part of the guard detachment in the Rzuchów forest camp (known as the Waldlager, or forest camp) testified that the bodies extracted from the mass graves had been burned in three or four pits about 5 meters long, 4 meters wide and three meters deep, and that later some craftsmen had built a large oven with a chimney 4 to 5 meters high to burn further corpses. A variety of cremation devices and methods were used or tested at Chełmno because the change of this camp’s body disposal method coincided with the start of the operation known as Aktion 1005, an attempt to eliminate the traces of the Nazis’ massacres in Eastern Europe by exhuming and burning the corpses, which was entrusted to SS-Standartenführer Paul Blobel, a veteran of World War I familiar with explosives and flamethrowers who had commanded large-scale massacres of Jews in the occupied Soviet territories, including the ones at Babi Yar (Kiev) and Drobitski Yar (Kharkov). Chełmno became Blobel’s experimentation site for devices and methods of which those considered efficient were later applied at other extermination camps and at the massacre sites of mobile killing units in the occupied Soviet territories. He tried fire bombs, but these caused large fires in the surrounding woods. According to Höß he also tried blowing up the bodies, with unsatisfactory results. Another of Blobel’s creations was presented to a number of high-ranking SS-officers (SS–Obersturmbannführer Höß, SS-Untersturmführer Hößler and SS-Untersturmführer Dejaco) during a visit to Chełmno on 16.09.1942, mentioned by Höß and in a report prepared by Dejaco on 17.09.1942. At the trial against Dejaco and Ertl in Vienna in 1972, Dejaco described the device as having had the aspect of a round coal furnace (Kohlenmeiler) and a diameter of 4 to 6 meters, in which the corpses had been burned alternated with layers of wood. Blobel is supposed to have stated that the installation was not suitable for rapid corpse cremation because combustion was slow, but that the principle of alternating corpses and wood should be maintained. Yet another Blobel contraption was described by SS-man Fritz Ismer, a member of the Chełmno staff. When working on the removal of the mass graves at Chełmno, this witness had watched an experiment in which Blobel had attempted to set corpses in a mass grave on fire with a flamethrower-like apparatus that the witness described as having the aspect of an enlarged blow torch. The flame had not been very strong, and the witness concluded that the experiment must have failed. He had heard of no further experiments by Blobel. However, he added, "We in time developed a certain technique in burning corpses on the grids<" ("Wir entwickelten aber im Laufe der Zeit eine gewisse Technik bei der Leichenverbrennung auf den Rosten). Ismer’s deposition suggests that the procedure successfully applied to burn the corpses extracted from the Chełmno mass graves was a system of grids akin to what was applied at the Aktion Reinhard(t) camps, while the above-mentioned testimony of Frank Sch. suggests that these grids were placed inside of pits. Both descriptions also match the mention of corpse burning in open fires that Pawlicka-Nowak refers to as having been reported by witnesses. Whether or not it was Blobel who developed or at least contributed to the development of this method – Ismer’s testimony suggests otherwise – Blobel seems to have claimed the credit for it, judging by the deposition of Treblinka commandant Stangl whereby "Wirth spoke of a Standartenführer who had experience in burning corpses" and "according to the Standartenführer’s experience, corpses could be burned on a roaster, and it would work marvelously". The aforementioned context allows for concluding that Standartenführer in question was SS-Standartenführer Paul Blobel, as is further corroborated by the fact that the method of burning corpses on roasters was adopted not only at the Aktion Reinhard(t) camps but also by Blobel himself when he went on to remove mass graves in the occupied Soviet territories, for instance at Babi Yar, where the corpses were cremated on funeral pyres built on iron rails. Larger bones remaining after cremation were crushed in a ball mill, whereupon they were filled into paper sacks together with the ash and buried in the surroundings of the forest camp, scattered or thrown into the Ner River. 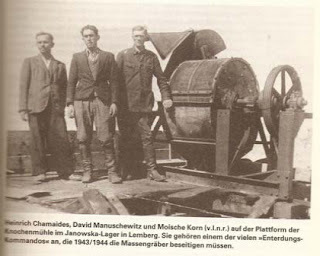 The ball mill was ordered from the firm Schriever and Company in Hamburg following an unsuccessful attempt to obtain a bone mill from the Łódź Ghetto’s Jewish council. They were built deep in the ground and did not project above its surface; and were shaped like inverted cones with rectangular bases. At the top on the ground level the furnaces measured 6 x 10 m (2O x 33 ft.) and they were 4 m (13 ft.) deep. At the bottom by the ash-pit they measured 1.5 x 2 m (95 x 6 in. ft.). The grates were made of rails. A channel to the ash-pit ensured the admittance of air and permitted the removal of ashes and bones. The sides of the furnace were made of firebrick and faced with cement. In the furnace were alternate layers of chopped wood and corpses: to facilitate combustion, space was left between the corpses. The furnace could hold 100 corpses at a time, but as they burned down, fresh ones were added from above. After the end of transports from the Łódź Ghetto, which in August 1944 went no longer to Chełmno but to Auschwitz-Birkenau, the remaining Jewish slave laborers, including the witnesses Zurawski and Srebrnik, had to work in removing all remaining traces of the extermination activity, including further burning of corpses in the forest camp – obviously the job of exhuming and cremating the corpses from the 1st phase’s graves had not been completed in 1942/43. Zurawski and Srebrnik managed to flee when the remaining prisoners were liquidated in January 1945. Together with Mordechai Podchlebnik, who had managed to flee during the 1st phase, they were the only survivors of Chełmno. Archaeological research has not only corroborated and complemented but considerably increased the scarce eyewitness information about the Chełmno cremation devices. In 1986/87, relics of a blown-up cremation oven were found. Described as probably rectangular in shape, with a measurable size of 17x17m, walls obliquely narrowing towards the inside, concrete pipes supplying air to the hearth, a depth of 4.5 meters, and a bottom layer of brick and concrete debris, it is believed to be one of the two furnaces with chimneys observed by outside witnesses during the 1st phase (one such furnace, with a chimney 4 to 5 meters high, was described by the above-mentioned German witness Frank Sch.). Five objects found in 2003/2004 were presumed by the archaeologists to have been "most likely built in order to liquidate quickly the decomposing corpses from the mass graves". Object 2/03 is square on the surface (8x8 m) and narrows towards the bottom, with the depth slightly exceeding 5 m. It contains traces of preserved concrete pipes, which were probably meant to supply air to the furnace interior. Object 3/03 has the shape of an 8x9 m rectangle, lumps of concrete as well as pieces of chamotte brick and concrete pipes having been found when uncovering the object. Such objects were also found when uncovering Object 4/03, which has the shape of a 7x8 m rectangle. Object 5/03 has a rectangular outline with the measurements 3.50 x 4 m. Object 20/03 is an 8x8 m square in horizontal projection and includes lumps of concrete and blackened chamotte bricks. All objects except Object 5/03, which was not explored, were found to be filled with soil containing burn waste, ashes, and pieces of burned and/or crushed bones. The descriptions of objects 3/03, 4/03, 5/03 and 20/03 bring to mind the three or four pits about 5 meters long, 4 meters wide and 3 meters deep that were mentioned by Frank Sch. , whose size estimate comes across as below the mark. The identical square surface shape and measurements of Object 2/03 and Object 20/03, on the other hand, suggest that these were identically built objects narrowing towards the bottom, even though such narrowing is not mentioned regarding Object 20/03. The northern segment of the grave may probably be linked to different attempts to remove the corpses, burn them inside the graves or in primitive furnaces-hearths as well as to the process of crushing bones. In the other segment, bones ground into bonemeal can already be found. During one of the traverse probing surveys we found a fragment of a smoked concrete pipe. This may suggest that in some part of the grave, perhaps in the initial phase, corpses were burned. A larger object found in 2003/2004, on the other hand, was believed by the archaeologists to probably be the relics of a furnace "used for liquidating corpses during the systematic center operation" (a function also attributed to an object called "10/03", which is mentioned but not described in the text and can be seen next to "21/03" in the map of Plot IV linked to in Pawlicka-Nowak’s article). Object 21/03 is described as having the shape of a 25x9 m rectangle and being over 6.30 m deep, 2 pipes supplying air to the inside having been found together with a shaft about 4 m wide, presumed to have been used for removing ash from the ash pit, and pieces of concrete as well as nearby fence posts. The object is "filled with gray, very sandy humus, mixed with inclusions of burn waste, ash, and crushed burned bones". Thus the total number of identified objects believed to be cremation structures is eight. Other works by Pawlicka-Nowak are referred to as mentioning eight objects, of which four are defined as "field furnaces" and four as "crematoria". This result, if accurate, would match eyewitness testimonies about two furnaces with chimneys in the 1st phase, two furnaces without chimneys in the 2nd phase, and four cremation pits as described by Frank Sch. (presumably with grids as mentioned by Fritz Ismer). However, uncovering the objects believed to be traces of another furnace "used for liquidating corpses during the systematic center operation is stated to be still outstanding in Pawlicka-Nowak’s online article, and I currently have no information about whether and when this uncovering was done. 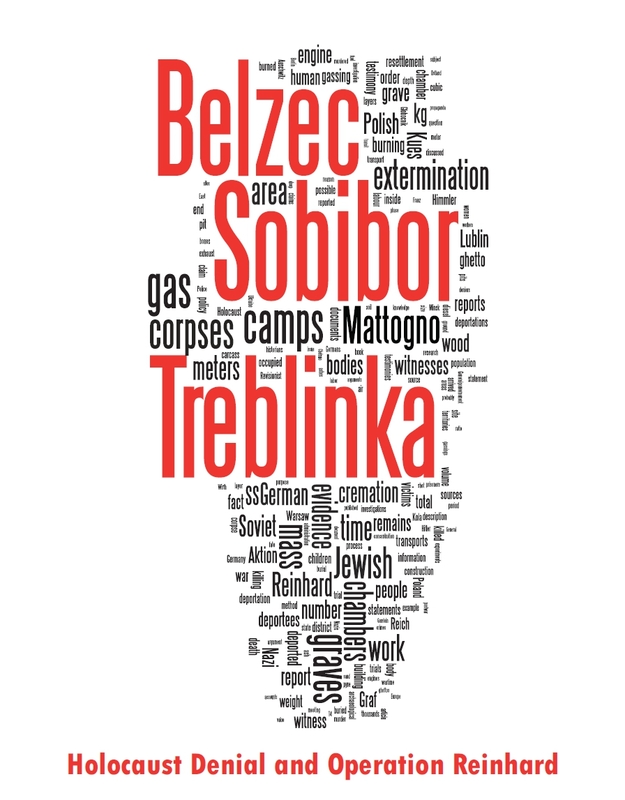 The body of eyewitness, documentary and archaeological evidence outlined above is attacked by Carlo Mattogno in his recent book about Chełmno extermination camp. Mattogno’s first target is the supposed contradiction between Blobel’s cremation activities at Chełmno within the context of Aktion 1005 on the one hand and hygienic considerations underlying the decision to cremate the corpses at Chełmno on the other. Why the two propositions are supposed to be mutually exclusive Mattogno doesn’t explain. This is followed by pointless considerations about the task of removing the bodies by cremation having been entrusted by Gestapo chief Heinrich Müller to a layman in the field like his subordinate SS-Standartenführer Blobel instead of a civilian expert in building cremation ovens like Kurt Prüfer. But wait, Mattogno alerts his readers in the next section of his book. Was Höß really at Chełmno? Mattogno concludes that, despite his quite detailed description of the visit, and despite his name being expressly mentioned in Dejaco’s travel report, Höß never set foot at Chełmno. The basis of this conclusion, besides Chełmno not being mentioned in the documents about the service trip to inspect the "special installation", is that in another part of his notes Höß states that Chełmno (Kulmhof) was no longer in operation when he visited it. As this was not the case in mid-September 1942, Mattogno sharply concludes, Höß cannot have been at Chełmno on the date mentioned in Dejaco’s travel report, and the experimental station for Aktion Reinhard field ovens must have been somewhere else. A more reasonable explanation, if what Höß stated were not compatible with what is known about Chełmno’s operation period, would be that Höß was simply mistaken in assuming that Chełmno was no longer operating as a killing centre when he visited it, having gained this impression because he saw no transports being "processed" at Chełmno and was told by the local commandant that the gas vans were not a very reliable killing method. Yet Höß was actually correct, insofar as the flow of transports to Chełmno stopped following the deportation of 15,700 Jews from the Łódź ghetto on the 1st, the 2nd and between 7 and 12 September 1942 and a final deportation from the Zelów ghetto on 14 September 1942, the camp staff’s main task thereafter being the removal of the bodies. If the last deportations of the camp’s 1st phase took place prior to the visit from Auschwitz on 16 September, it is possible that the local camp commandant had told Höß that he expected no more transports. In this sense the camp had indeed stopped operating. Besides indulging in somewhat-less-than-reasonable mental gymnastics to dismiss Höß’s account of his visit to Chełmno as untrue, Mattogno also gives a poor impression of his research capabilities (or his intellectual honesty) when claiming that the Auschwitz commandant’s testimony is the only evidence about Blobel’s activities at Chełmno. For these activities, as mentioned above, were also expressly described by Fritz Ismer, independently of Höß, Dejaco or any other participant in the inspection of the "special installation" on 16.09.1942. They were furthermore mentioned by several other members of the Chełmno Sonderkommando. Caption translates: "Heinrich Chamaides, David Manuschewitz and Moische Korn (f.l.t.r.) on the platform of the bone mill in the Janowska camp in Lemberg. They belong to one of the many »unearthing detachments« which in 1943/44 have to remove the mass graves". In case his argumentation doesn’t catch, Mattogno concludes this section pointing out that the bone mill inquired about by Ribbe could, according to his letter to Rumkowski dd. 16.07.1942, also have been operated by hand instead of a motor. A manually operated bone mill is supposed to be incompatible with crushing the bones of tens of thousands of corpses, but why this should be so Mattogno doesn’t explain. Mattogno reproduces without comment Judge Bednarz’s description of the 1st phase cremation devices in the Central Commission’s report and a more detailed description from a later book authored by Bednarz, which besides the two crematorium ovens with chimneys mentions enormous fireplaces (focolari) on which the accumulated corpses (which presumably means those extracted from the mass graves) were cremated. He then focuses on the detailed descriptions of the 2nd phase cremation devices in the Central Commission’s report (quoted above) and in Bednarz’s book, which adds the details that 12 corpses were placed in the bottom layer, that the fire was lit from below and no gasoline or other flammable substance was poured on the corpses, and that the corpses burned in more or less 20 minutes. Mattogno argues that these devices resemble a nineteenth century contraption for incinerating animal carcasses known as the Feist apparatus, in order to claim that the installed cremation capacity would have been insufficient for the purposes of Chełmno extermination camp. The capacity issue shall be discussed in the following blogs. Following these elaborate musings, Mattogno turns his guns against the archaeological investigations carried out in the Rzuchów forest in 1986/87 and in 2003/2004. Regarding the 6 cremation sites described in Pawlicka-Nowak’s article about archaeological research (objects 2/03, 3/03, 4/03, 5/03, 20/03 and 21/03), Mattogno’s argument is that a) four of them (2/03, 3/03, 4/03, 5/03) had already been examined before 2003/2004 but not considered cremation sites and b) their current interpretation as cremation sites is highly disputable. The first claim is supposed to be supported by confronting the map showing the latest archaeological works with an earlier map drawn by Zdzisław Lorek for the Konin regional museum in 1989 and updated in 1996. The reader is left to guess which of the objects mentioned in Mattogno’s discussion of this earlier map are being referred to. If the reader looks at the section from this earlier map featured in the appendix of Mattogno’s book as Document 12c, he will see four black objects whose location more or less coincides with that of objects 2/03, 3/03, 4/03, 5/03 on the map from the later investigation. These objects are marked with circled letters on the earlier map, to which are attributed meanings that, according to Mattogno’s discussion of this map, are based on eyewitness testimonies, meaning that they were not established by archaeological examination before 2003/2004. The only one of these objects mentioned by Pawlicka-Nowak as having been uncovered fragmentarily during the 1986/87 excavations is object 2/03. This means that two furnaces with areas of 64 and 56 square meters were individualized without any probe, 3 with areas of 72, 14 and 189 square meters were individualized with just one probe and 1 with an area of 64 square meters was individualized with 2 probes, Mattogno indignantly exclaims. Mattogno’s reading of the pertinent map leaves much to be desired. In the image below, which can be enlarged by clicking on it, I have on the map of Plot IV in Pawlicka-Nowak’s article drawn red circles around the numbers of the objects, red squares around the numbers of probing excavations that in my opinion correspond to one of the objects in question, and green squares around the numbers of probes that I consider to possibly correspond to one such object. Object 21/03: 4 probing excavations (numbers XLV, XXXIX, XLVI and XLIV), with probing excavations XLIII and XLVII possibly also belonging to this object. So it looks like there is no such thing as objects identified without probing excavations and Mattogno missed one probing excavation regarding object 3/03 and at least 3 probing excavations regarding object 21/03 when analyzing the map. While it is not clear from the structure of the article’s section about the archaeological work in 2003/04 whether the above-quoted description refers only to the mass graves or to all objects in the Rzuchów Forest, including the ones considered to be cremation sites, the stated purpose of the method – avoiding disturbance of the layers and places where human remains were expected to be found – calls for assuming the latter. Regarding the crematorium found in the 1986/87 excavations, Mattogno claims that this object a) was not as big as stated in Pawlicka-Nowak’s article, b) cannot have had a brick chimney and c) was the only crematorium furnace used at Chełmno. The first claim is based on photographs (supposedly taken in 1997) of a partially reconstructed furnace site (documents 17 – 20 in Mattogno’s appendix), which according to Mattogno measures only 6 x 5 meters instead of 17 x 17 meters as stated in archaeological reports. The smaller size is supposed to be confirmed by a photo of the archaeological excavation regarding that furnace attached as Document 14. How so Mattogno doesn’t explain, and Document 14, which shows part of a large pit excavated around what looks like part of a rectangular stone structure, does little to elucidate the reader. The reconstructed furnace site looks like it is indeed somewhat smaller than 17x17 m, but the only indication that it covers all and not just part of the furnace’s area is a plaque in Polish translated by Mattogno as informing visitors that the furnace’s contours were reconstructed on the surface with authentic fragments from the furnace ("In superficie sono stati riconstruiti i suoi contorni con frammenti autentici del forno"). Assuming that this means a contradiction between archaeological reporting and information on a plaque for visitors, precedence should be given to the former as it is less likely to contain mistaken information. The claim that the object found in the 1986/87 excavations cannot have had a brick chimney is based on a similarity between its described construction and that of the Feist apparatus, which had no brick chimney and, like this object, narrowed towards the inside. The object is supposed to be the only cremation oven that ever existed in the camp because there are "no certain archaeological traces" ("nessune traccia archeologica certa") of the other second-phase oven and the two first-phase crematoria with chimneys described by eyewitnesses. Earlier in his book Mattogno quotes a statement by historian Konnilyn G. Feig (obviously based on the above-quoted description of the 2nd phase cremation ovens, which the historian seems to mistakenly consider as having been what was used in both phases of the camp’s operation), as well as Pawlicka-Nowak’s reasoning that the furnaces in both phases must have been built close to each other because their constructor was the same man, one SS- Hauptscharführer Runge (never mind that the wording and context of Pawlicka-Nowak’s statement refer to geographical proximity rather than similarity of construction) to support his claim that only devices resembling the Feist apparatus were used in both phases of the camp's operation. Now he reduces the two such devices previously considered to just one, which implies the accusation that the archaeologists who identified seven other cremation objects in 2003/04 (objects 2/03, 3/03, 4/03, 5/03, 10/03, 20/03 and 21/03) manipulated their finds or (unlike self-appointed master archaeologist Mattogno) didn't know what they were doing. Geographical proximity of the first phase crematoria later blown up and the second phase cremation furnaces later dismantled (with a possible use of structures left over from the first phase to build the second-phase ovens), plus the mentioned incompleteness of archaeological work regarding objects 10/03 and 21/03, is probably the reason why only one crematorium proper – as opposed to the objects referred to as "field crematoria and pits for burning corpses" – had been identified when Pawlicka-Nowak's online article was written (though the description of object 02/03 suggests one of the second-phase cremation devices described by Judge Bednarz). Mattogno insinuatingly remarks that the "simple" excavation required to gain certainty about the nature of objects 10/03 and 21/03 has not yet been carried out, but doesn't explain what, other than the remains of at least one former cremation furnace, the above-mentioned description of object 21/03 is supposed to indicate. 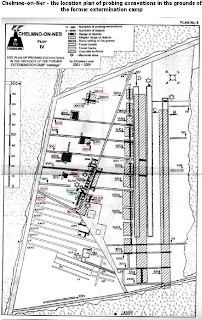 If Mattogno is right about the object found in 1986/87 being a cremation device without a brick chimney, it is entirely possible that objects 10/03 and 21/03 are the remains of the crematoria with chimneys observed by witnesses in the 1st phase. The other oven similar to the one uncovered in 1986/87 would then be Object 2/03, which like the former object is described as narrowing towards the inside, thus matching the above-quoted description of the second-phase furnaces in the Central Commission’s report, whereas objects 3/03, 4/03, 5/03 and 20/03 would be traces of open-air cremation grates similar to those used at the Aktion Reinhard(t) camps, corresponding to the above-mentioned descriptions of Frank Sch. and Fritz Ismer. Alternatively, it is possible (considering that Object 20/03 has the same square surface area as Object 2/03, though unlike the latter it is not described as narrowing towards the inside) that the second-phase furnaces were objects 02/03 and 20/03, that only three objects (3/03, 4/03 and 5/03) correspond to grate structures described by Ismer and Sch. (which doesn’t exclude the possibility of there having been more such structures, considering the above-mentioned traces of open-air cremation found in the second grave), and that besides the crematoria with chimneys (objects 10/03 and 21/03) there was another furnace (the 1986/87 object) also used for cremating corpses right after gassing in the latter stages of the first phase. Either of these possible conclusions does justice to known eyewitness and archaeological evidence, whereas Mattogno’s mental gymnastics don’t take into account much of either. Either possibility does not require baseless conjectures about lying or demented eyewitnesses and incompetent or dishonest archaeologists, whereas Mattogno’s assessment depends on both. Either has therefore at least a good chance of being correct, whereas Mattogno’s attack on inconvenient evidence about mass cremation at Chełmno must be added to the list of Mattogno’s failures. About 145,000 of the victims were Jews, see the Bonn District Court’s judgment Landgericht Bonn v. 30.3.1963 (hereinafter "LG Bonn Chełmno"), quoted in Adalbert Rückerl, NS-Vernichtungslager im Spiegel deutscher Strafprozesse (hereinafter "Rückerl, Vernichtungslager"), 2nd edition 1978 by Deutscher Taschenbuch Verlag GmbH & Co. KG, Munich, pages 252 – 295. Additionally there were about 5,000 Gypsies from the Łódź Ghetto (LG Bonn Chełmno, Rückerl, Vernichtungslager, p. 289) and an unknown but comparatively low number of Soviet prisoners of war and non-Jewish Poles (LG Bonn Chełmno, Rückerl, Vernichtungslager, p. 280, where mental patients are mentioned; Museum of the former Extermination Camp in Chełmno-on-Ner, hereinafter "Chełmno Museum"; "Extermination Camp Chelmno (Kulmhof)", in: Central Commission for Investigation of German Crimes in Poland, GERMAN CRIMES IN POLAND (Warsaw, 1946, 1947), hereinafter "Central Commission, Chełmno"). The Bonn District Court also mentioned a transport of about 50-75 children aged 4-14 years, who were better dressed and fed than the Jewish children (LG Bonn Chełmno, Rückerl, Vernichtungslager, p. 280). These children were possibly from Lidice (Chełmno Museum). LG Bonn Chełmno, Rückerl, Vernichtungslager, pp. 292/293, with a complete breakdown of transports. LG Bonn Chełmno, Rückerl, Vernichtungslager, pp. 290/291. Regarding the size and capacity of these graves see the blog Mattogno on Chełmno Mass Graves. LG Bonn Chełmno, Rückerl, Vernichtungslager, p. 273. Rudolf Höß, "Die »Endlösung der Judenfrage« im Konzentrationslager Auschwitz" (hereinafter "Höß, Endllösung") written in Krakow in 1946, published in: Rudolf Höß, Kommandant in Auschwitz. Autobiographische Aufzeichnungen. Edited by Martin Broszat, 19th edition April 2004 by Deutscher Taschenbuch Verlag GmbH & Co. KG, Munich (hereinafter "Kommandant in Auschwitz"), pp. 237-259, here pp.244/245; Jens Hoffmann, "Das kann man nicht erzählen": "Aktion 1005" - Wie die Nazis die Spuren ihrer Massenmorde in Osteuropa beseitigten (hereinafter "Hoffmann, Aktion 1005"), 2008 Konkret Literatur Verlag, Hamburg, pp. 74ff. 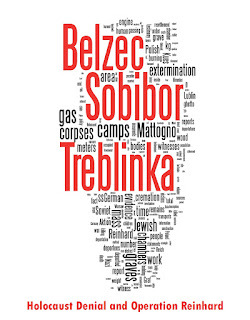 Yitzhak Arad, Belzec, Sobibor, Treblinka. The Operation Reinhard Death Camps, Indiana University Press, Bloomington and Indianapolis 1987 (hereinafter "Arad, Reinhard"), p. 171; see also the blog "The Germans wouldn’t have done it that way". Höß, Endlösung, Kommandant in Auschwitz p. 244. Reisebericht über die Dienstfahrt nach Litzmannstadt, Nuremberg Document NO-4467. Jean-Claude Pressac, Os Crematórios de Auschwitz. A Maquinaria do Assassínio em Massa (hereinafter "Pressac, Crematórios"). Translated by António Moreira, 1993 Editorial Notícias, Lisbon, p. 100. Hoffmann, Aktion 1005, p. 81 (interrogation of Fritz Ismer on 1 August 1961, criminal case 141 Js 204/60 Vol. 4, fl. 1419ff.). At the Aktion Reinhard(t) camps Sobibór and Treblinka, and presumably also at Bełżec extermination camp, the corpses were burned on huge grids made of railway rails above a pit in which a kindling fire was lit, descriptions of the burning process at Sobibór suggesting that the pit in which the kindling fire was lit was dug from the sole of a larger pit in which the grid was placed in order to save heat and protect the fire against wind, like in the most successful carcass-burning experiments conducted in the early 20th Century by German veterinarians Dr. Lothes and Dr. Profé. For details see the blogs Belzec Mass Graves and Archaeology: My Response to Carlo Mattogno (4,2) (hereinafter "Bełżec Response 4 (2)") and Animal Carcass Burning Experiments by Dr. Lothes and Dr. Profé (hereinafter "Animal Carcass Burning"). This is also the opinion of Arad (Reinhard, p. 174, where Stangl’s statement is quoted). Gerald Reitlinger (The Final Solution. The Attempt To Exterminate The Jews Of Europe, 1939-1945, hereinafter "Reitlinger, Final Solution", 2nd revised edition, 1968 Thomas Yoseloff, Cranbury, New Jersey, p. 146) wrote that, after the visit of Höß et al, "Blobel adopted the method which he was to introduce at Treblinka death camp and at the immense mass graves outside the larger towns of the Baltic States, White Russia and the Ukraine, a vast pyre constructed of iron rails and wooden sleepers". Regarding Babi Yar, see the relevant parts of the translated accounts of witnesses David Budnik and Yakov Kaper. Hoffmann, Aktion 1005, p. 223; Central Commission, Chełmno. Central Commission, Chełmno. A similar description was provided in Soviet captivity by camp staff member Walter Piller, quoted in Shmuel Krakowski, Das Todeslager Chełmno/Kulmhof. Der Beginn der »Endlösung«, 2007 Wallstein Verlag LG Bonn Chełmno (hereinafter "Krakowski, Chełmno"), p. 132. According to Piller the oven was 8 meters long and 5-6 meters wide at the top and narrowed along a depth of 7-8 meters, with a grid made of railway rails about 1 or 1 ½ meters above the foundation. Piller also mentioned an angular air shaft about 8 meters long and wide enough for a man in ducked position to move to the grid and take out the ashes. The oven burned with pine wood taken there by truck through a drive nearby the ovens ("Der Ofen wurde mit Kiefernholz gespeist, welches eigens durch einen in der Nähe der Öfen befindlichen Schlag nach dort mit LKW gefahren wurde"). LG Bonn Chełmno, Rückerl, Vernichtungslager, p. 286; Hoffmann, Aktion 1005, p. 229. LG Bonn Chełmno, Rückerl, Vernichtungslager, p. 287; Hoffmann, Aktion 1005, p. 230f. ; Central Commission, Chełmno. Pawlicka-Nowak mentions an apparent contradiction between the testimonies of Dejaco and another witness, whereby the Chełmno field ovens had a round shape, and the rectangular shapes of the cremation objects archaeologically identified in 2003/04. These eyewitness observations suggest that they were watching experimental devices that, unlike those identified by archaeologists, never saw much operational use. 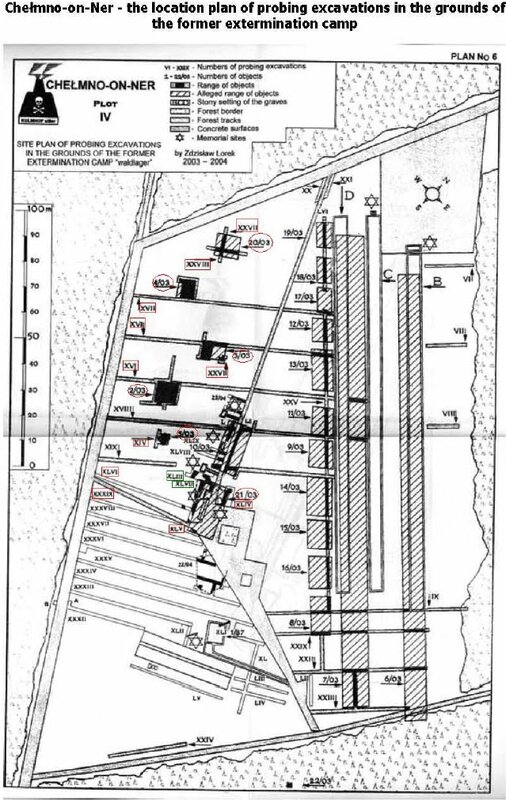 Chełmno-on-Ner - the location plan of probing excavations in the grounds of the former extermination camp. Gilead, Isaac, Yoram Haimi and Wojciech Mazurek, "Excavating Nazi Extermination Centres" (hereinafter "Gilead et al, Extermination Centres") in: Present Pasts, Vol. 1 (2009), online. Just 60 kilometers away, though this becomes a great distance when Mattogno points it out on page 102 of his book. Mattogno, Chełmno p. 102, asks why the delegation from Auschwitz visited the Łódź before going to the special installation, if inspecting that was what they had come for. Why it shouldn’t have done so he doesn’t explain. Krakowski, Chełmno, p. 122. The last transport from the Zelów ghetto is mentioned on pp 95/96, the dates of the Łódź deportations in September are stated in a ghetto statistic published on 1 October 1942, transcribed on page 119. See also Rückerl, Vernichtungslager, pages 280 (where it is stated that transports diminished considerably since the autumn of 1942) and 290 (where an absence of documents and reliable testimonies about transports from October 1942 to March 1943 is mentioned); Hoffmann, Aktion 1005, pp. 223/224. Confirmed, but very "very belatedly" (molto tardivamente), by Walter Dejaco (Mattogno, Chełmno, p. 98). Rückerl, Vernichtungslager p. 274, footnote 64; Hoffmann, Aktion 1005, pp. 80f., referring to criminal case 141 Js 204/60, Vol. 13, fl. 4935 ff., interrogation of Julius Bauer on 4/5 July 1963 (footnote 98 on page 81; the date of Bauer’s interrogation is mentioned in footnote 93). Julius Bauer was Blobel’s driver, to whom Blobel mentioned that the new task he had been given was a "Secret Reich Matter" (Geheime Reichssache) and that Bauer was to keep strictest silence about all matters related thereto (Hoffmann, p. 80). See note 22. Ribbe’s letter to Rumkowski dd. 16 July 1942, according to Mattogno, is only available as a transcription in a 1946 collection of documents about the German occupation in Poland by A. Eisenach, which is supposed to make its authenticity questionable. Mattogno, Chełmno pp. 103 ff. A ball mill, as explained in the respective Wikipedia page, is a cylindrical device used in grinding (or mixing) materials like ores, chemicals, ceramic raw materials and paints. Ball mills rotate around a horizontal axis, partially filled with the material to be ground plus the grinding medium. Different materials are used as media, including ceramic balls, flint pebbles and stainless steel balls. An internal cascading effect reduces the material to a fine powder. Robin O’Neill, Belzec: Stepping Stone to Genocide Hitler’s answer to the Jewish Question, Chapter 10. O’Neill mentions that the machine was operated by a Janowska inmate, a Hungarian Jew named Szpilke. The machine used at Janowska concentration camp is mentioned in the testimonies before the Lemberg Deputy District Attorney of Heinrich Chamaides on 21.9.1944 and of Moische Korn on 13.9.1944, quoted in the document collection »Gott mit uns« Der deutsche Vernichtungskrieg im Osten 1939 – 1945, edited by Ernst Klee and Willi Dreßen, 1989 S. Fischer Verlag GmbH, Frankfurt am Main, pp. 226 ff. Shown in Klee et al, as previous note, p. 225. Compare the Janowska photo with other images of ball mills. Mattogno, Chełmno, pp. 103 ff. As above, pp. 107f. The second source cites is W. Bednarz, Obóz straceń w Chelmnie nad Nerem. As above, pp. 109/110, quoting Bednarz, as previous note, pp. 22-23. As above, pp. 108 ff. [From item 6 onward the reliability of recollection is especially diminished.]" Magnitudes and quantities are obviously not something that eyewitnesses usually recall with great accuracy. As above; Höß, Endlösung, Kommandant in Auschwitz, p. 243. Mattogno, Chełmno pp. 118-210. Mattogno rhetorically asks why, if simple roasters or simple pits were sufficient to burn tens of thousands of corpses without difficulty, the Reich Main Security Office (Reichssicherheitshauptamt – RSHA) ordered Blobel to conduct burning experiments at Chełmno. Actually the evidence suggests that Blobel was given the task but no instructions as to the methodology, and that the simple but efficient method of burning corpses on grids in or over pits resulted from a trial-and-error approach that Blobel, with his apparent liking for imaginative contraptions, may not even have significantly contributed to – even though he later adopted this method and, as pointed out above, even seems to have claimed the credit for it. Pawlicka-Nowak, Chełmno Museum; the map is the one mentioned in note 30. Pawlicka-Nowak, Chełmno Museum. At that time the object was misinterpreted as a pit for burning useless belongings of the victims. Mattogno may be given the benefit of doubt in this respect insofar as seems to have a problem with his eyesight. The article on the Chełmno Museum’s website mentions the name of the translator, Arkadiusz Kamiński, following the name of its author, Łucja Pawlicka-Nowak. Mattogno obviously mixed up the author’s surname with that of the translator and thus made Łucja Pawlicka-Nowak into "Łucja Pawlicka Kamiński".